Now that the beautiful weather is finally on the horizon, it's time to start thinking (or rethinking) landscape designs. In this article we've gathered 20+ CAD drawings that will help you with your landscape design needs and perhaps provide a little inspiration for you too. Cover the cut off edge and secure the edging in place at that point. Join two pieces of cut off edging to make a perfect 90º corner. DeWitt non-woven, needle-punched Fiber Fabric can be used as a stabilizing force to prevent unwanted movements in excavated areas such as roads, sidewalks, patios, and embankments. This product is excellent protection against damaging soil when placed around drainage pipes, retaining walls, and buried or exposed fixtures. Woven Geotextile Fabrics are high-quality polypropylene fabrics that stabilize the sub grade and separate soil from the aggregate. With everything in place, you'll experience a reduction in maintenance costs and extend life of your pavement structure. These fabrics work well for unpaved structures as well. Non-Woven Geotextiles are comprised of strong polypropylene staple fibers. They are designed to allow for drainage and soil filtration, separation, permanent erosion control, asphalt overlay, and cushioning. DIEHARD™ Transplant is a Granular inoculant used as a natural soil amendment used when planting trees and shrubs. Commercial steel edging will be provided by Border Concepts, Inc. Edging is sized per plan and detail. Edging is fabricated in 16' 0" sections with anchor stake loops stamped in face of sections, 32" on center. Use 15" tapered steel anchoring stakes (3/16" thick) provided by manufacturer. Edging and stakes are finished with exterior enamel paint. Our unique "Snip & Flex" feature allows total freedom when designing your driveway or sidewalk. You can create unlimited curves and angles in minutes, ensuring an aesthetically pleasing and structurally superior project. This flexibility and strength has made Snap Edge® the premier edging choice of professionals. Made of non-rusting recycled aluminum. Completely hidden from view. One piece does straight or curved patterns. Will not warp in heat or crack in cold. Easy to insert piece to piece connection system. Stronghold can be installed under pavers (Although not recommended by ICPI). Designed for use with concrete pavers & gardens, Barrier prevents pavers and other materials from moving horizontally and provides a clean, permanent edge to your garden. Open base allows grass roots to help anchor edging in place. As the producer of this specialty crushed stone, we are able to monitor quality from the beginning of the manufacturing process all the way through to the final product. Whether it’s blasting at the quarry, crushing to a specific grade, drying a material, bagging and palletizing, or simply the storage of the finished product, every effort is made to ensure a clean consistent aggregate is delivered to our customers. Designed specifically for professional landscapers, contractors and garden centers, DeWitt Weed-Barrier® Pro is available in black, white and brown. There's a color to fit every mulch or stone application. Specifically made as a landscape and garden fabric, DeWitt Weed-Barrier® Pro is UV and hydrophilic treated for water permeability. Dewitt Pro-5 Weed Barrier is the industry's best 5 oz. woven, needle punched, polypropylene fabric designed for professional and commercial use. Pro-5 conserves soil moisture, increases plant growth, prevents unwanted weeds from germinating and is approved by leading landscape architects and government agencies. Typar® Premium Landscape Fabric blocks weeds around plants; unlike plastic, lets moisture, nutrients and air pass through; and is guaranteed to last for 15 years with proper installation and maintenance. International TreeScapes offers the largest array of custom-made, museum-quality, artificial trees and plants in the industry. 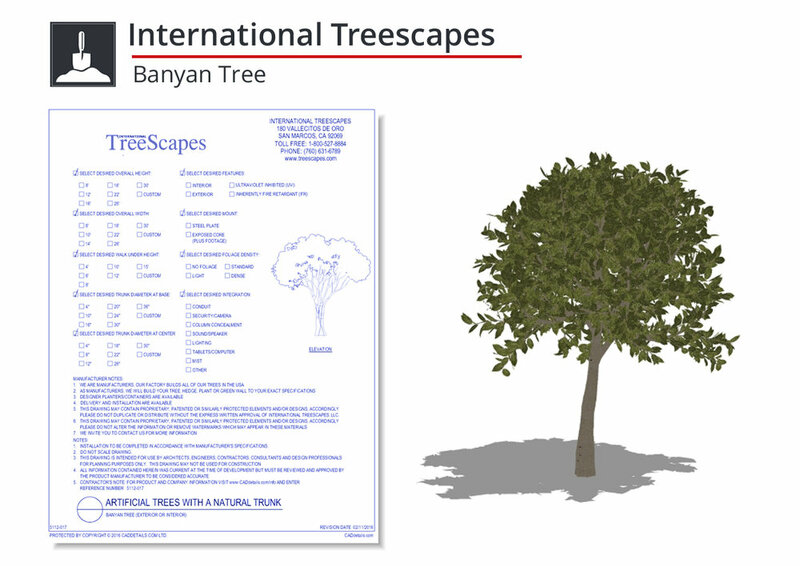 Looking for even more landscape CAD files? Download our QuickPack here.